"To do" redirects here. For the auxiliary use of the verb "to do" in the English language, see Do-support. Time management is the process of planning and exercising conscious control of time spent on specific activities, especially to increase effectiveness, efficiency, and productivity. It involves a juggling act of various demands upon a person relating to work, social life, family, hobbies, personal interests and commitments with the finiteness of time. Using time effectively gives the person "choice" on spending/managing activities at their own time and expediency. It is a meta-activity with the goal to maximize the overall benefit of a set of other activities within the boundary condition of a limited amount of time, as time itself cannot be managed because it is fixed. Time management may be aided by a range of skills, tools, and techniques used to manage time when accomplishing specific tasks, projects, and goals complying with a due date. Initially, time management referred to just business or work activities, but eventually the term broadened to include personal activities as well. A time management system is a designed combination of processes, tools, techniques, and methods. Time management is usually a necessity in any project development as it determines the project completion time and scope. It is also important to understand that both technical and structural differences in time management exist due to variations in cultural concepts of time. Project management: Time management can be considered to be a project management subset and is more commonly known as project planning and project scheduling. Time management has also been identified as one of the core functions identified in project management. Attention management relates to the management of cognitive resources, and in particular the time that humans allocate their mind (and organize the minds of their employees) to conduct some activities. Organizational time management is the science of identifying, valuing and reducing time cost wastage within organizations. It identifies, reports and financially values sustainable time, wasted time and effective time within an organization and develops the business case to convert wasted time into productive time through the funding of products, services, projects or initiatives at a positive return on investment. Creating an environment for effectiveness is important for time management as it limits the potential for distractions and unnecessary activities. For example, having a tidy environment enables individuals to have greater focus and limits time spent searching for items necessary to accomplish the tasks. In addition, the timing of tackling tasks is important as tasks requiring high levels of concentration and mental energy are often done in the beginning of the day when a person is more refreshed. Literature[which?] also focuses on overcoming chronic psychological issues such as procrastination. Excessive and chronic inability to manage time effectively may result from Attention deficit hyperactivity disorder (ADHD) or attention deficit disorder (ADD). Diagnostic criteria include a sense of underachievement, difficulty getting organized, trouble getting started, trouble managing many simultaneous projects, and trouble with follow-through. [page needed] Some authors[which?] focus on the prefrontal cortex which is the most recently evolved part of the brain. It controls the functions of attention span, impulse control, organization, learning from experience and self-monitoring, among others. Some authors[quantify] argue that changing the way the prefrontal cortex works is possible and offer a solution. These goals are recorded and may be broken down into a project, an action plan, or a simple task list. For individual tasks or for goals, an importance rating may be established, deadlines may be set, and priorities assigned. This process results in a plan with a task list or a schedule or calendar of activities. Authors may recommend a daily, weekly, monthly or other planning periods associated with different scope of planning or review. This is done in various ways, as follows. D - Tasks that are unimportant and not urgent. Each group is then rank-ordered by priority. To further refine the prioritization, some individuals choose to then force-rank all "B" items as either "A" or "C". ABC analysis can incorporate more than three groups. ABC analysis is frequently combined with Pareto analysis. The 80-20-rule can also be applied to increase productivity: it is assumed that 80% of the productivity can be achieved by doing 20% of the tasks. Similarly, 80% of results can be attributed to 20% of activity. If productivity is the aim of time management, then these tasks should be prioritized higher. It depends on the method adopted to complete the task. There is always a simpler and easier way to complete the task. If one uses a complex way, it will be time consuming. So, one should always try to find out alternative ways to complete each task. The "Eisenhower Method" stems from a quote attributed to Dwight D. Eisenhower: "I have two kinds of problems, the urgent and the important. The urgent are not important, and the important are never urgent. "Note that Eisenhower does not claim this insight for his own, but attributes it to an (unnamed) "former college president." This method is inspired by the above quote from U.S. President Dwight D. Eisenhower. Note, however, that Eisenhower seems to say that things are never both important and urgent, or neither: So he has two kinds of problems, the urgent and the important. POSEC is an acronym for "Prioritize by Organizing, Streamlining, Economizing and Contributing". The method dictates a template which emphasizes an average individual's immediate sense of emotional and monetary security. It suggests that by attending to one's personal responsibilities first, an individual is better positioned to shoulder collective responsibilities. Prioritize - Your time and define your life by goals. Organize - Things you have to accomplish regularly to be successful (family and finances). Streamline - Things you may not like to do, but must do (work and chores). Economize - Things you should do or may even like to do, but they're not pressingly urgent (pastimes and socializing). Contribute - By paying attention to the few remaining things that make a difference (social obligations). A task list (also to-do list or things-to-do) is a list of tasks to be completed, such as chores or steps toward completing a project. It is an inventory tool which serves as an alternative or supplement to memory. Task lists are used in self-management, grocery lists, business management, project management, and software development. It may involve more than one list. Map out everything that is important, by making a task list. Create "an oasis of time" for one to control. Don't think a critical task will get done in one's spare time. Numerous digital equivalents are now available, including Personal information management (PIM) applications and most PDAs. There are also several web-based task list applications, many of which are free. Task lists are often diarised and tiered. The simplest tiered system includes a general to-do list (or task-holding file) to record all the tasks the person needs to accomplish, and a daily to-do list which is created each day by transferring tasks from the general to-do list. An alternative is to create a "not-to-do list", to avoid unnecessary tasks. A daily list of things to do, numbered in the order of their importance, and done in that order one at a time until daily time allows, is attributed to consultant Ivy Lee (1877–1934) as the most profitable advice received by Charles M. Schwab (1862–1939), president of the Bethlehem Steel Corporation. An early advocate of "ABC" prioritization was Alan Lakein, in 1973. In his system "A" items were the most important ("A-1" the most important within that group), "B" next most important, "C" least important. A particular method of applying the ABC method assigns "A" to tasks to be done within a day, "B" a week, and "C" a month. To prioritize a daily task list, one either records the tasks in the order of highest priority, or assigns them a number after they are listed ("1" for highest priority, "2" for second highest priority, etc.) which indicates in which order to execute the tasks. The latter method is generally faster, allowing the tasks to be recorded more quickly. Another way of prioritizing compulsory tasks (group A) is to put the most unpleasant one first. When it's done, the rest of the list feels easier. Groups B and C can benefit from the same idea, but instead of doing the first task (which is the most unpleasant) right away, it gives motivation to do other tasks from the list to avoid the first one. A completely different approach which argues against prioritising altogether was put forward by British author Mark Forster in his book "Do It Tomorrow and Other Secrets of Time Management". This is based on the idea of operating "closed" to-do lists, instead of the traditional "open" to-do list. He argues that the traditional never-ending to-do lists virtually guarantees that some of your work will be left undone. This approach advocates getting all your work done, every day, and if you are unable to achieve it helps you diagnose where you are going wrong and what needs to change. Management of the list can take over from implementing it. This could be caused by procrastination by prolonging the planning activity. This is akin to analysis paralysis. As with any activity, there's a point of diminishing returns. To remain flexible, a task system must allow for disaster. A company must be ready for a disaster. Even if it is a small disaster, if no one made time for this situation, it can metastasize, potentially causing damage to the company. To avoid getting stuck in a wasteful pattern, the task system should also include regular (monthly, semi-annual, and annual) planning and system-evaluation sessions, to weed out inefficiencies and ensure the user is headed in the direction he or she truly desires. If some time is not regularly spent on achieving long-range goals, the individual may get stuck in a perpetual holding pattern on short-term plans, like staying at a particular job much longer than originally planned. Many companies use time tracking software to track an employee's working time, billable hours etc., e.g. law practice management software. Many software products for time management support multiple users. They allow the person to give tasks to other users and use the software for communication. Task list applications may be thought of as lightweight personal information manager or project management software. Modern task list applications may have built-in task hierarchy (tasks are composed of subtasks which again may contain subtasks), may support multiple methods of filtering and ordering the list of tasks, and may allow one to associate arbitrarily long notes for each task. In contrast to the concept of allowing the person to use multiple filtering methods, at least one software product additionally contains a mode where the software will attempt to dynamically determine the best tasks for any given moment. Time management systems often include a time clock or web-based application used to track an employee's work hours. Time management systems give employers insights into their workforce, allowing them to see, plan and manage employees' time. Doing so allows employers to control labor costs and increase productivity. A time management system automates processes, which eliminates paper work and tedious tasks. Getting Things Done was created by David Allen. The basic idea behind this method is to finish all the small tasks immediately and a big task is to be divided into smaller tasks to start completing now. The reasoning behind this is to avoid the information overload or "brain freeze" which is likely to occur when there are hundreds of tasks. The thrust of GTD is to encourage the user to get their tasks and ideas out and on paper and organized as quickly as possible so they're easy to manage and see. Francesco Cirillo's "Pomodoro Technique" was originally conceived in the late 1980s and gradually refined until it was later defined in 1992. The technique is the namesake of a pomodoro (Italian for tomato) shaped kitchen timer initially used by Cirillo during his time at university. The "Pomodoro" is described as the fundamental metric of time within the technique and is traditionally defined as being 30 minutes long, consisting of 25 minutes of work and 5 minutes of break time. Cirillo also recommends a longer break of 15 to 30 minutes after every four Pomodoros. Through experimentation involving various work groups and mentoring activities, Cirillo determined the "ideal Pomodoro" to be 20–35 minutes long. Time management also covers how to eliminate tasks that do not provide value to the individual or organization. According to Sandberg, task lists "aren't the key to productivity [that] they're cracked up to be". He reports an estimated "30% of listers spend more time managing their lists than [they do] completing what's on them". Hendrickson asserts that rigid adherence to task lists can create a "tyranny of the to-do list" that forces one to "waste time on unimportant activities". Learning is considered to be an activity of stress free notifying of an exposure received with mindfulness. Any form of stress is considered to be debilitative for learning and life, even if adaptability could be acquired (eustress) its effects are damaging. But stress is an unavoidable part of daily life and Reinhold Niebuhr suggests to face it, as if having "the serenity to accept the things one cannot change and having the courage to change the things one can." Part of setting priorities and goals is the emotion "worry," and its function is to ignore the present to fixate on a future that never arrives, which leads to the fruitless expense of one's time and energy. It is an unnecessary cost or a false aspect that can interfere with plans due to human factors. The Eisenhower Method is a strategy used to compete worry and dull-imperative tasks. Worry as stress, is a reaction to a set of environmental factors; understanding this is not a part of the person gives the person possibilities to manage them. Athletes under a coach call this management as "putting the game face." Change is hard and daily life patterns are the most deeply ingrained habits of all. To eliminate non-priorities in study time it is suggested to divide the tasks, capture the moments, review task handling method, postpone unimportant tasks (understood by its current relevancy and sense of urgency reflects wants of the person rather than importance), control life balance (rest, sleep, leisure), and cheat leisure and non productive time (hearing audio taping of lectures, going through presentations of lectures when in queue, etc.). Certain unnecessary factors that affect time management are habits, lack of task definition (lack of clarity), over-protectiveness of the work, guilt of not meeting objectives and subsequent avoidance of present tasks, defining tasks with higher expectations than their worth (over-qualifying), focusing on matters that have an apparent positive outlook without assessing their importance to personal needs, tasks that require support and time, sectional interests and conflicts, etc. A habituated systematic process becomes a device that the person can use with ownership for effective time management. Differences in the way a culture views time can affect the way their time is managed. For example, a linear time view is a way of conceiving time as flowing from one moment to the next in a linear fashion. This linear perception of time is predominant in America along with most Northern European countries such as, Germany, Switzerland, and England. People in these cultures tend to place a large value on productive time management, and tend to avoid decisions or actions that would result in wasted time. This linear view of time correlates to these cultures being more “monochronic”, or preferring to do only one thing at a time. Generally speaking, this cultural view leads to a better focus on accomplishing a singular task and hence, more productive time management. Another cultural time view is multi-active time view. In multi-active cultures, most people feel that the more activities or tasks being done at once the happier they are. Multi-active cultures are “polychronic” or prefer to do multiple tasks at once. This multi-active time view is prominent in most Southern European countries such as Spain, Portugal, and Italy. In these cultures, the people often tend to spend time on things they deem to be more important such as placing a high importance on finishing social conversations. In business environments, they often pay little attention to how long meetings last, rather, the focus is on having high quality meetings. In general, the cultural focus tends to be on synergy and creativity over efficiency. A final cultural time view is a cyclical time view. In cyclical cultures, time is considered neither linear nor event related. Because days, months, years, seasons, and events happen in regular repetitive occurrences, time is viewed as cyclical. In this view, time is not seen as wasted because it will always come back later, hence, there is an unlimited amount of it. This cyclical time view is prevalent throughout most countries in Asia including Japan, China, and Tibet. It is more important in cultures with cyclical concepts of time to complete tasks correctly, therefore, most people will spend more time thinking about decisions and the impact they will have before acting on their plans. Most people in cyclical cultures tend to understand that other cultures have different perspectives of time and are cognizant of this when acting on a global stage. This broad understanding is something that all cultures can model and apply to help improve business relations on an international level. ^ Stella Cottrell (2013). The Study Skills Handbook. Palgrave Macmillan. pp. 123+. ISBN 978-1-137-28926-1. ^ Project Management Institute (2004). A Guide to the Project Management Body of Knowledge (PMBOK Guide). ISBN 1-930699-45-X. Archived from the original on 2008-11-04. ^ "NIMH » Attention Deficit Hyperactivity Disorder". www.nimh.nih.gov. Archived from the original on 2016-12-29. Retrieved 2018-01-05. ^ Hallowell, Edward M.; Ratey, John J. (1994). Driven To Distraction: Recognizing and Coping with Attention Deficit Disorder from Childhood Through Adulthood. Touchstone. ISBN 9780684801285. Retrieved 2013-07-30. ^ a b Lakein, Alan (1973). How to Get Control of Your Time and Your Life. New York: P.H. Wyden. ISBN 0-451-13430-3. ^ "The 80/20 Rule And How It Can Change Your Life". Archived from the original on 2017-11-17. Retrieved 2017-09-16. ^ Background on the Eisenhower quote and citations to how it was picked up in media references afterwards are detailed in: Garson O’Toole (May 9, 2014), Category Archives: Dwight D. Eisenhower Archived 2015-04-11 at Archive.today, Quote Investigator. (retrieved 31 March 2015). ^ Fowler, Nina (September 5, 2012). "App of the week: Eisenhower, the to-do list to keep you on task". Venture Village. ^ a b c d e McKay; Brett; Kate (October 23, 2013). 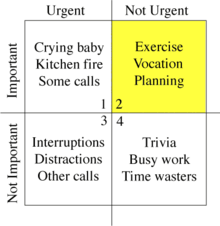 "The Eisenhower Decision Matrix: How to Distinguish Between Urgent and Important Tasks and Make Real Progress in Your Life". A Man's Life, Personal Development. Archived from the original on 2014-03-22. Retrieved 2014-03-22. ^ a b c d "The Eisenhower Method". fluent-time-management.com. Archived from the original on 2014-03-03. ^ a b c Morgenstern, Julie (2004). Time Management from the Inside Out: The Foolproof System for Taking Control of Your Schedule—and Your Life (2nd ed.). New York: Henry Holt/Owl Books. p. 285. ISBN 0-8050-7590-9. ^ Mackenzie, Alec (1972). The Time Trap (3rd ed.). AMACOM - A Division of American Management Association. pp. 41–42. ISBN 081447926X. ^ LeBoeuf, Michael (1979). Working Smart. Warner Books. pp. 52–54. ISBN 0446952737. ^ Forster, Mark (2006-07-20). Do It Tomorrow and Other Secrets of Time Management. Hodder & Stoughton Religious. p. 224. ISBN 0-340-90912-9. ^ "86 Experts Reveal Their Best Time Management Tips". Archived from the original on March 3, 2017. Retrieved March 3, 2017. ^ Partho (18 February 2009). "Top 10 Time Management Software for Windows". Gaea News Network. Archived from the original on 2017-01-12. Retrieved October 9, 2016. ^ Cirillo, Francesco (November 14, 2009). The Pomodoro Technique. Lulu.com. ISBN 978-1445219943. ^ Jeremy Harmer (2007). How to Teach English. Pearson Longman. pp. 47+. ISBN 978-1-4058-5309-5. ^ Phillip Brown (2014). 26 Words That Can Change Your Life: Nurture Your Mind, Heart and Soul to Transform Your Life and Relationships. BookB. pp. 76–. ISBN 978-0-9939006-0-0. ^ Richard Walsh (2008). Time Management: Proven Techniques for Making Every Minute Count. Adams Media. pp. 232–238. ISBN 978-1-4405-0113-5. ^ Richard Walsh (2008). Time Management: Proven Techniques for Making Every Minute Count. Adams Media. pp. 161–163. ISBN 978-1-4405-0113-5. ^ Patrick Forsyth (2013). Successful Time Management. Kogan Page Publishers. pp. 90–93. ISBN 978-0-7494-6723-4. ^ a b c d e f Communications, Richard Lewis, Richard Lewis. "How Different Cultures Understand Time". Business Insider. Retrieved 2018-12-04. ^ a b Pant, Bhaskar (2016-05-23). "Different Cultures See Deadlines Differently". Harvard Business Review. Retrieved 2018-12-04. Allen, David (2001). Getting things done: the Art of Stress-Free Productivity. New York: Viking. ISBN 978-0-670-88906-8. Fiore, Neil A (2006). The Now Habit: A Strategic Program for Overcoming Procrastination and Enjoying Guilt- Free Play. New York: Penguin Group. ISBN 978-1-58542-552-5. Le Blanc, Raymond (2008). Achieving Objectives Made Easy! Practical goal setting tools & proven time management techniques. Maarheeze: Cranendonck Coaching. ISBN 90-79397-03-2. Secunda, Al (1999). The 15 second principle : short, simple steps to achieving long-term goals. New York: New York : Berkley Books. p. 157. ISBN 0-425-16505-1. Look up time management in Wiktionary, the free dictionary.